if you find them in your front yard? Last year I discovered black chanterelles (Craterellus fallax) in the moss near our ferny verge. There were only a few, but I felt enormously lucky to find this delicacy in my own yard. This year the crop is enormous and I was positively giddy as I picked enough to fill the dehydrator. I dried some for myself, some for friend/colleague/mushroom mentor Gary Lincoff, and some for a certain fellow forager who just happens to have a birthday this week... Not all mushrooms dry well, but the flavor of black chanterelles is intensified by drying and the texture of the re-hydrated mushroom is excellent. Purple-gilled laccaria (Laccaria ochropurpurea) is abundant throughout what passes for our lawn; a combo of grass, weeds, and moss is apparently perfect for mushroom cultivation! Most field guides deem it edible but without a strong flavor of its own. It has a thick, meaty texture and takes on the flavor of whatever you cook it with, which in my case is usually onions, bacon, and cream. One of my lo-cal specials. They look TOTALLY different to me, plus the growing conditions are also very different. Jack o'Lanterns grow in clumps, at the base of tree trunks or on underground wood. 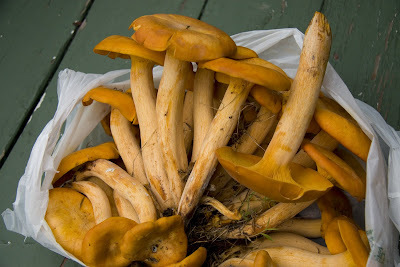 The chanterelles grow in moss or grass, in open oak woods. While you may find many in a single location, and even 2 or 3 growing together, they don't form hefty clumps like the JoLs. 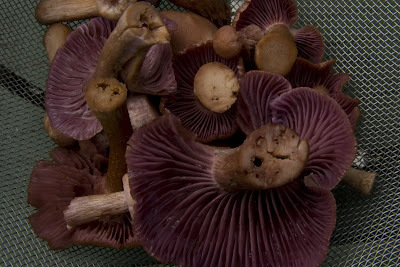 The chanterelles are also much smaller, and the color is different. Sadly I haven't been able to get a spore print, perhaps because of all the rain. I left some in situ (a weedy slope between oak woods and country road) and will try another spore print next weekend. For now, I've dried the probably-chanterelles and wait impatiently. I'm also still trying to i.d. this white bolete. It doesn't bruise blue and the spores aren't red or orange (two general clues that a bolete isn't edible) so chances are it's a tasty one. I found three in the moss/lawn, about 10 feet from the woods (primarily oak, beech, & pine). Even though I know there are no boletes out there that will kill me (how reassuring! ), I'd rather wait and get an i.d. before I chow down. With all this excitement I hardly got anything else done this weekend, but that's ok. Mushrooms are an ephemeral crop; postpone the harvest and you may return to find only the slimy, insect infested remains of what once was glorious deliciousness. Any and all assistance with identification is welcome! can you come forage around our apt? the shroom find is UN-believable! i love, love, love chanterelles. you lucky dog! i.d. the white ones carefully please! Yeah, those white ones can be deadly! I promise, I'm ALWAYS super-careful w/shrooms! The BEST foraging is in your yard. It is your reward for doing yardwork and for choosing the right spot to live in. Really, really hoping you don't know anyone else with a birthday this week, lol! I found some boletes at NYBG this weekend, but couldn't ID them well enough for certain edibility (there are some blue-staining edibles, just to make it confusing). Also some black-staining polypore, edible but gotta agree with Gary that the taste is disappointing. Your shroom finds are much more exciting! Leda, you are the ONLY forager I know (personally) who has a birthday this week. Hope you enjoy them.